Maybe I’m biased, because I’m a chef, but one of my greatest beliefs is that the history of a culture can be seen through its food. One of my passions outside of the food world is history (as I’m sure my wife will tell you), and the world has made some amazing discoveries through treasure-hunting, archeology, etc, but many people don’t realize that you can learn a lot by taking an in-depth look into the dishes and ingredients of a nation. That’s why I love food… it’s a universal language. It can be understood by every single person on the planet, when our spoken languages may fail us, and getting to know the cuisine of a particular country can help you understand where they came from, as well as where they are going…. sometimes more than any book can teach you. Over the past years, I’ve dedicated my life to truly understanding Portuguese culture through its food. The cuisine of this small southwestern European nation, often overlooked in favour of its larger neighbours, is a perfect example a cuisine mirroring the layering of several civilizations throughout history, going back to the Neolithic (late Stone-age) people. 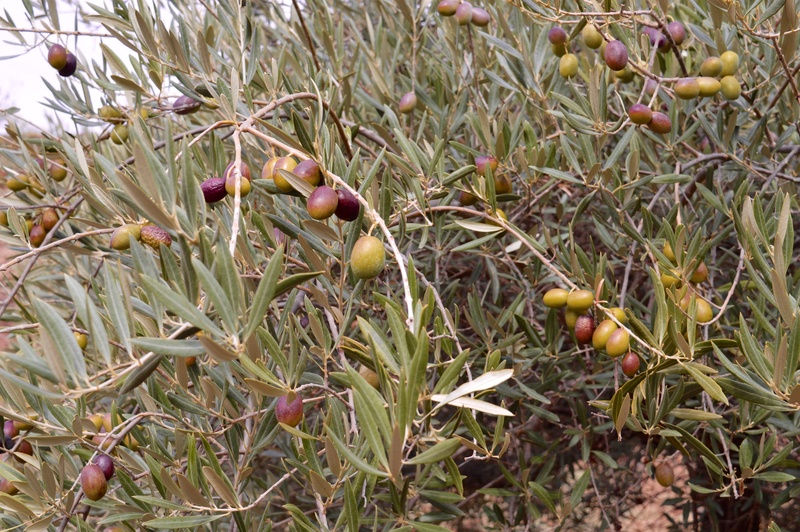 Olives have a strong root in Portugal’s ancient past, with remains being found back to stone age people, as well as a few trees being dated to over 3,500 years old! Portuguese wines also have a deep history, with production dating as far back as 2000 BCE with the Tartessians in the southern Algarve region (native to Iberia) and the Phoenicians who were the greatest sailing and trading culture of their age, hailing from the are of modern day Lebanon, but also then expanding to create the Carthaginian empire (known for Hannibal the Great). Without any doubt, Portugal is a wine country. In fact, Portugal has perhaps the best value for quality ratio of any wine-producing nations… it also has the highest per capita wine consumption. 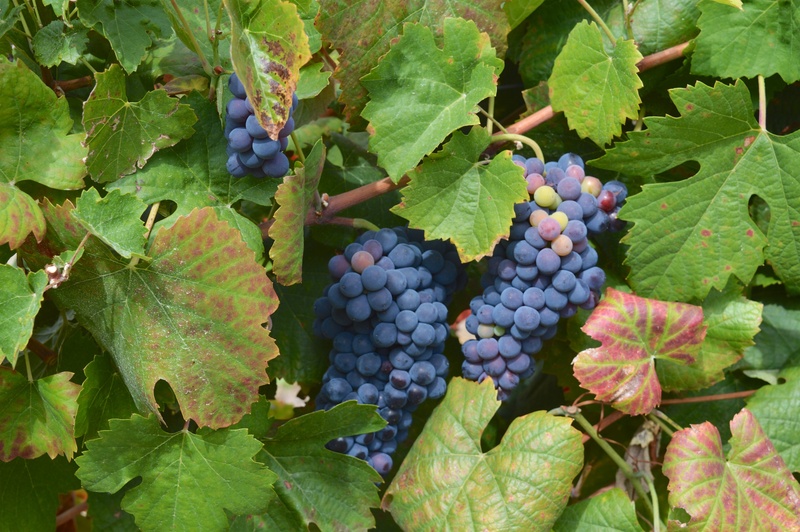 There’s 340 grape varieties in common use today, and 258 of them are native varieties and exist only in Portugal, providing one of the wine world’s biodiversities. The grapes were always here. Germanic cultures flourished in the Portuguese region, giving this country a very strong Celtic heritage… Portuguese often refer to themselves as Lusitanians. Then Christianity thrived under the Visigoths (who took over after the fall of the Roman empire), but little is left in terms of major influences on the cuisine from these times. 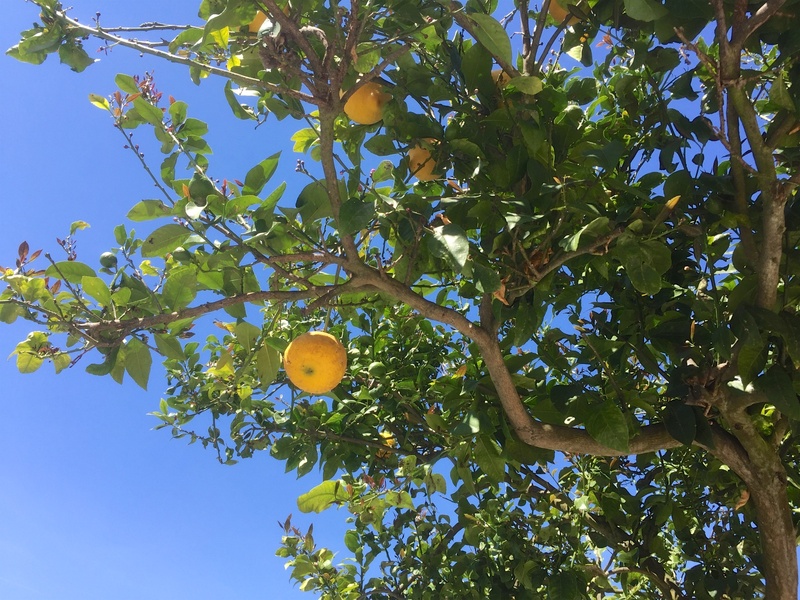 These two cultures are certainly major factors on Portuguese identity as a whole, but in culinary terms, there are other major players that contributed much more. 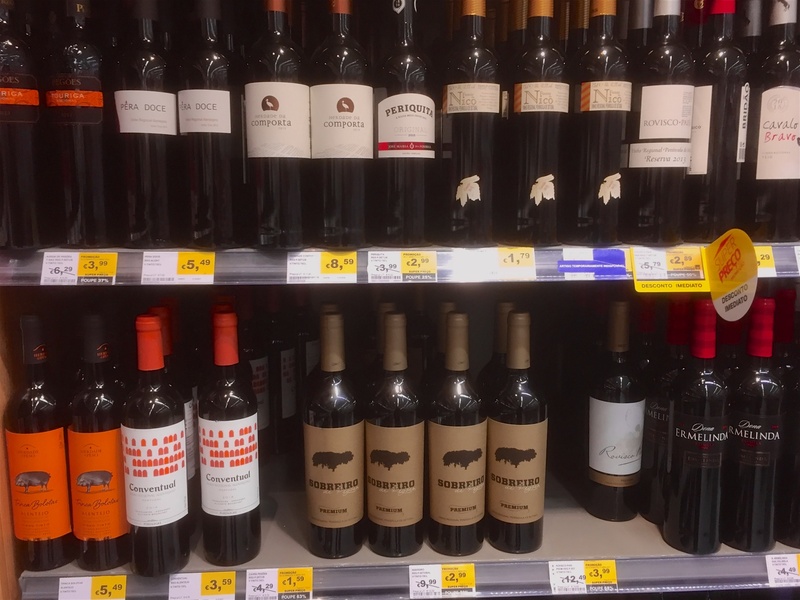 Why don’t we see many Portuguese wines in our stores? Because they keep it all for themselves! The Romans dominated after the Carthaginians were defeated, ending the Punic wars. They not only conquered local cultures wherever they went, but they also integrated with them, expanding trade across their empire… essentially starting the phenomenon of globalization. Olive oil and wine were paramount to Roman society, and with such great resources in the Portuguese region, this became an important export of this area. This is also when the long-standing of Portuguese pottery took hold, as it would be used to transport wine and oil back to Rome. Olive oil, wine and pottery were all introduced during the Phoenician trading era, but it was the Romans who really cemented their place in Portuguese history. Today, the hot, southern region of Alentejo in Portugal has the reputation of being the agricultural heart of the country, and this was no doubt launched by the Romans. Alentejo is littered with olive groves, vineyards cork trees, but the most dominant feature on the landscape are the wide open never ended wheat fields. The Roman empire grew so large, they needed to feed their people. The Alentejo region of Portugal was one of the various parts of the empire to be set up as a major production site for growing wheat to be sent across the Mediterranean to feed the masses. To this day, Portuguese bread is some of the best bread you can find, and is something that no Portuguese dinner table will ever be without. Wide open fields of yellow in Alentejo in September. Little known to many, the Romans also began the art of food preservation, something that is very important in today’s Portuguese food culture, although not brought to the forefront until over 1000 years later. Underneath the capital city of Lisboa (called Olisipo in Roman times), there are ruins of Roman factories that were used to make garum – a fermented fish sauce, which was sometimes also further reduced into a paste. Garum was used by the ancient Greeks as well, but it was the Romans who popularized it further. Garum was a strong source of protein, vitamins and minerals, but also of the umami-giving monosodium glutamate (yes, MSG is a natural substance coming from the sea, don’t believe the 80’s hype). It was used as one of the main condiments at the time, much like fish sauce is so famously used today across southeast Asia. The Romans also brought about the Portuguese tradition of salt production. 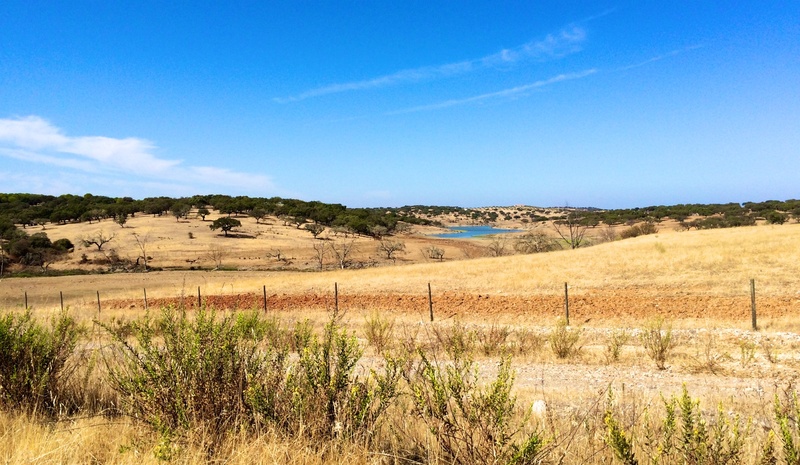 The town of Alcacer do Sal is named so because it was once a centre of this industry. Salt was not only an important food item, but also a form of currency in Roman days, as people used to be paid with salt (which is why we now have the word “salary”). Much like the culture in Andalusian Spain, Portugal’s history is dominated by the 400 year reign of the Islamic Moors in this region. The Moors were a mix of native Berbers from North Africa, and Islamic Arabs from the middle east, who crossed over the Strait of Gibraltar in 711 to conquer the Visigoths in Iberia. Moorish Portugal left an undeniable legacy on modern day culture. It can be clearly seen in the architecture, art, and language (over 1000 words in the Portuguese dictionary are of Moorish origins… pretty much any word beginning with “A” or containing an “X”), but also the food. The cataplana is one of the most “Portuguese” of all Portuguese cooking tools. 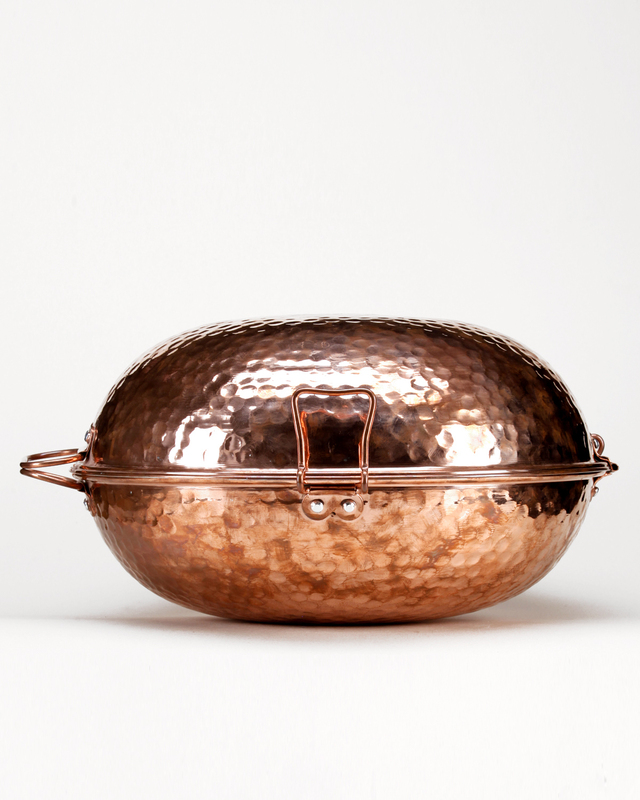 It’s a shell-like cooking pot, traditionally made of copper, used to steam/stew seafood in the Algarve region. There’s no clearly documented proof, but it’s rumoured to be of Moorish origin, as it cooks very much with the same concept as the Moroccan tagine. The clamshell shaped cataplana from Algarve, no doubt of Moorish influence. The Moors also brought in other now Portuguese staple items such as lemons, cilantro/coriander, and raisins. Ok, I wouldn’t necessarily say ALL Portuguese use these ingredients, as they are actually rarely used in more northern regions, or in the islands. However, in southern Portugal (Alentejo and Algarve, where the Moors were more dominant), you’ll often get served a super simple (but so amazing) dish of grilled pork with olive oil, lemon, and salt…. nothing else. Alentejo rice dishes often are lighter than their norther counterparts, using Moorish ingredients of cilantro, raisins and nuts. 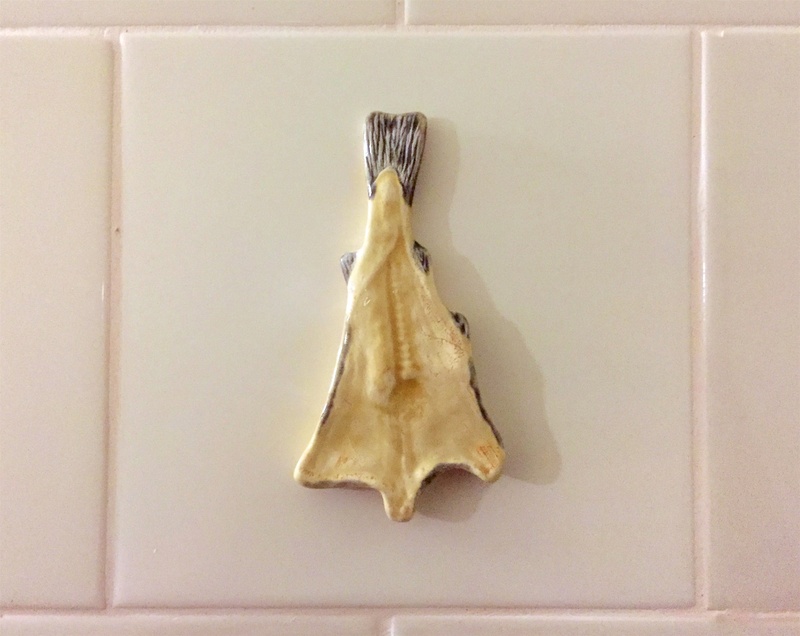 Which brings me to…. Almonds. There may be no greater influence on European cuisine than nuts… more specifically almonds. Marzipan and macarons would not be what they are without the introduction of almonds. Some say even pasta derived from almond pastries. In Portugal, dishes can be found everywhere, like the traditional toucinho do ceu (bacon from heaven) – a cake using ground almonds instead of wheat flour, and (traditionally) pork lard as the fat. In Spring, the white blossoms of the almond trees can be seen blanketing the Algarve and southern Alentejo regions. Portuguese legend tells that the origins of the almond trees in this region date back to when Ibn-Almuncim ruled from Silves (then, the capital of the Moorish Al-Gharb territory). He had married a Nordic princess named Gilda… most likely a slave captured or traded from the Vikings. Gilda fell into a deep depression, saying that she missed the snowy landscape of her homeland, so the Moorish prince imported almond trees from North Africa and planted them all over the Al-Gharb. When Spring came, the trees blossomed, covering the region in white flowers, to remind his princess of her winter wonderland. I’ve seen lemons here the size of footballs! With Portugal being such a heavily Catholic culture, you may never guess that it actually has a very strong Jewish history… mainly because much of it is semi-hidden. Like all of Iberia, Jews in Portugal had strong place in merchant trade. When the Catholic Inquisition took root in Spain in the 1490s, Sephardic Jews fled to Portugal where they were protected… at least, temporarily. Throughout the 1500s, Spain, as well as the Pope put heavy pressure on Portugal to institute the Inquisition as well, and there were occasions where riots broke out with Catholics massacring populations of Jews… perpetrators of these riots were later heavily punished (put to death or life in prison) by the King, as it was rumoured that the Portuguese monarchy secretly wanted to protect the Jews while also appeasing its powerful neighbours. This led to the creation of Jewish Portuguese sausages. 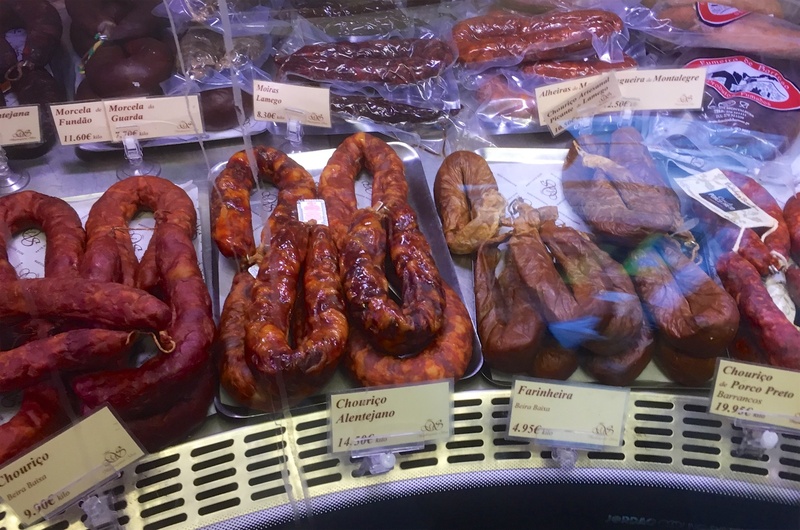 Sausages were, and still are a big deal in Portugal. The only problem for the Jewish population is that they are traditionally made with pork. While Jews were “converting” to Christianity (known as “New Christians”) they used eating sausages as a method of proving that they weren’t Jewish. To solve this problem, they created two sausages which are now staples in Portuguese cuisine. The very light-coloured Alheira is made using chicken and/or game meats, and Farinheira was originally made using only flour and spices… although now it’s often made with some pork fat. It’s also said that unleavened breads that can be found in various places on the mainland, as well as all across the Azores islands originated with Jewish culture. You can still find strong Jewish influence in towns like Castelo de Vide in Alentejo, or Belmonte in the Serra da Estrela region. This era is pretty much the Golden era of Portugal, and the Portuguese refer to this time period as the time of Discoveries, but I call it the maritime voyage because the places they went to were already “discovered” by native inhabitants. However, the Portuguese did introduce much of these worlds to Europe… or they at least made them accessible. This is by far, the most influential time period of Portuguese history on its cuisine. During the Middle Ages, the Ottoman Empire completely dominated trade between Europe and the Eastern half of the world. Up until this time, China and India were only accessible by land, through the Silk Road trading routes, and the ongoing Christian/Muslim conflicts led the Ottomans to blockade Europe from the spices of the east. It was because of this, that the medieval version of the “space race” was to find a sea route to the east, which led to countless sea voyages around the world, including the “discovery” of the Americas. All this was led by the Portuguese. Yeah, the Spanish were involved too, but it was the Portuguese who were really the dominant sailors of the time… even the sailors that made the most important Spanish voyages were from Portugal. I won’t go much further into the actual voyages and their history, because that’s about 40 other blog postings, but I’ll focus more on the food influences from this time. Nau. 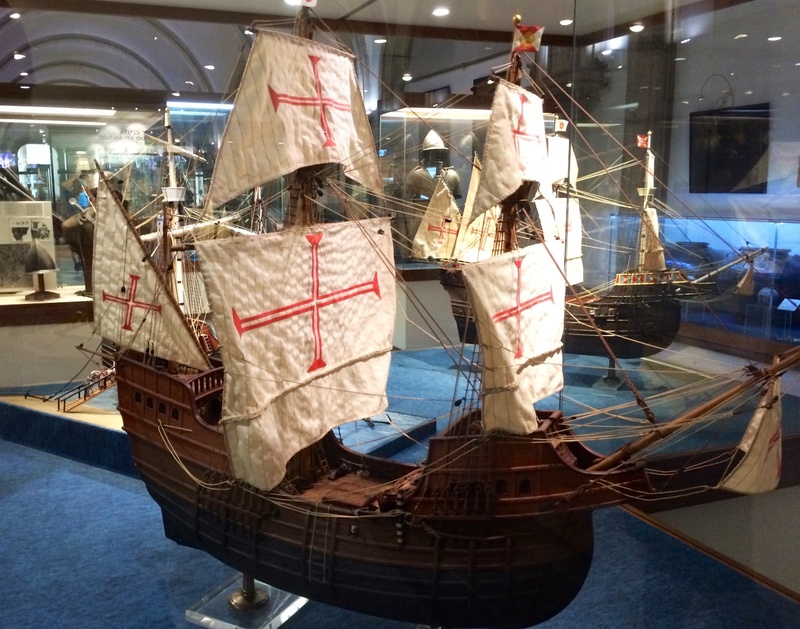 The Portuguese ship used in their worldly explorations, like the ones used by Vasco da Gama and Cristofóm Colón (Columbus). From the New World came tomatoes, potatoes, and corn… all ingredients that would make for a very strange Portuguese food world without them. Pretty much every meal you eat in Portugal has potatoes with it… usually fried. 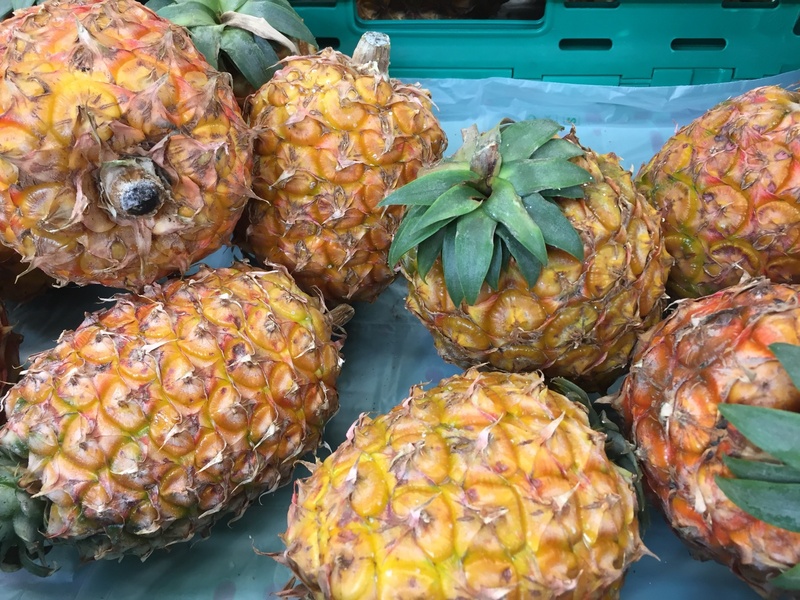 The Azores is home to many South American delicacies like annona, oraçais, and pineapple. From the east comes a whole collection of culinary goods. Tea, rice, cinnamon, cloves, mangoes, black pepper, bay leaves from India and China. Nesperas (plums) from Japan. Bananas from Southeast Asia. 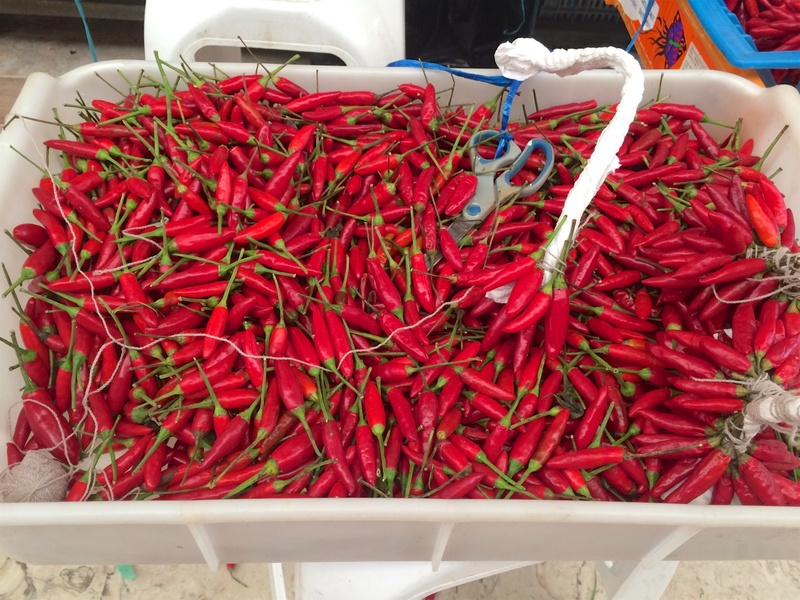 Piri-piri chiles from Africa. What would the western world be without all these amazing foods that the Portuguese introduced to Europe from their eastern voyages? During this time, Lisbon was the epicentre of the spice trade in Europe and all of these goods came to the continent through the Lisbon docks at what is now Praça do Commercio. Pineapples are one of the Açores main crops, specifically on the island of São Miguel. When you talk about Portuguese food there’s one thing that always comes to the front of the line… bacalhau. I find it so strange that a country that has access to some of the most diverse seafood in the world has dried, salted cod from Scandinavian and Canadian waters as their national fish. Bacalhau is so ingrained in Portuguese culinary culture that it’s said they have a recipe for every single day of the year. The popularity of the salt cod is a direct result of Portugal’s history as a maritime nation. Long before the days of refrigeration, preservation was the norm, and the sailors had to find a way to take food on long voyages. 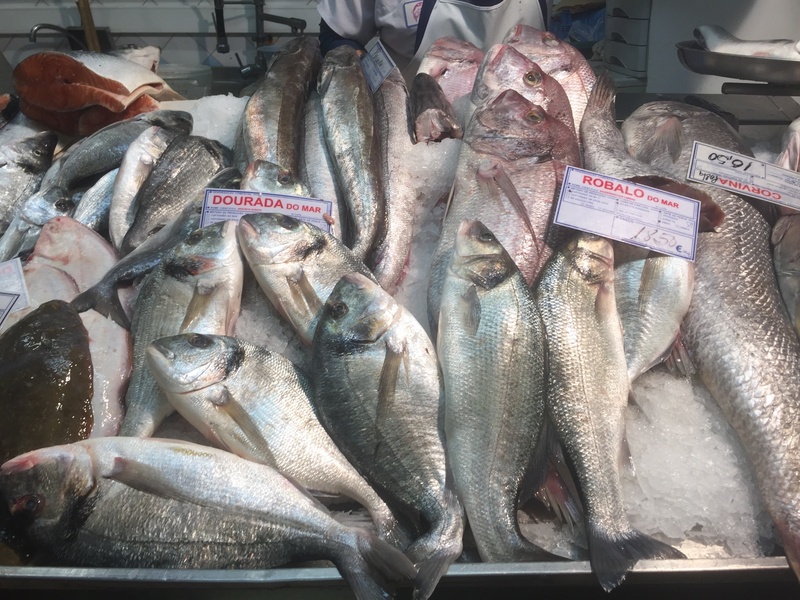 The fact that they had cod from Canadian waters is a telling fact that breaks all the rules in the history books, that leads many to believe that the Portuguese had been in the Americas long before Columbus (who I believe was Portuguese as well, but I’ll write a whole other post on that). We already know that the Vikings were in Canada, and the Portuguese have a long trading history with northern Europe, so it’s easy to think they had knowledge of these waters already. Portugal has one of the greatest diversity of seafood anywhere in the world. Yet, their national fish is bacalhau! Portuguese cuisine as it stands today is definitely heavily influenced by world travels, but it’s also important to note that Portugal has influenced food in other countries as well. Goan vindaloo curry is actually a fusion dish derived from the Portuguese stew vinho d’alho (wine and garlic). One of the most common dishes in Japanese restaurants, tempura was brought to Japan in the 1500s. Tempura’s roots can be found as one of the most common appetizers in Lisbon restaurants today, peixinhos da horta – “vegetable fish”, which are battered and deep fried green beans. Cabidela, a popular Macanese dish (from Macau) is heavily influenced by the Portuguese use of chicken blood that they drained and reserved during slaughter, then used in a stew. Brazil also has a version of cabidela, as well as one of their favourite dishes, feijoada which originally hails from Portugal. One of the most international fusions is also one that we think of as the most North American… chicken soup. In Portuguese speaking countries, it’s called Canja or Canja da Galinha. It’s unclear weather this was a Portuguese invention, or a Chinese one, but what is clear is that it’s a true fusion food (even though we don’t think of it as being one), as it uses the stock left from boiling chicken, along with rice. This was either influence by, or influenced the popular Chinese dish of congee. Not sure which one came first. All I know is that the rice came from China…. but whether they used it in a soupy form before the Portuguese got there or not, I don’t know. Who cares though, it’s yummy. Many North Americans think that Portuguese food is not much more than grilled chicken and rice, but they’ve obviously never been to Portugal. 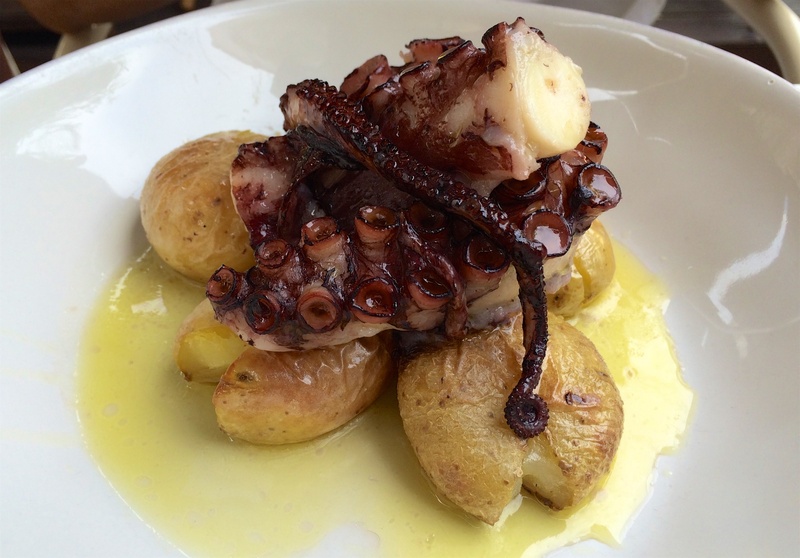 The current food scene is vibrant and very ethnically diverse, especially in Lisbon. Hopefully, if you made it to the end of this article, it’s clear now that it’s not only the modern food scene that is open to international flavours, but Portuguese cuisine itself is a direct result of the country’s occupation by multiple civilizations as well as its obsession with world travel. 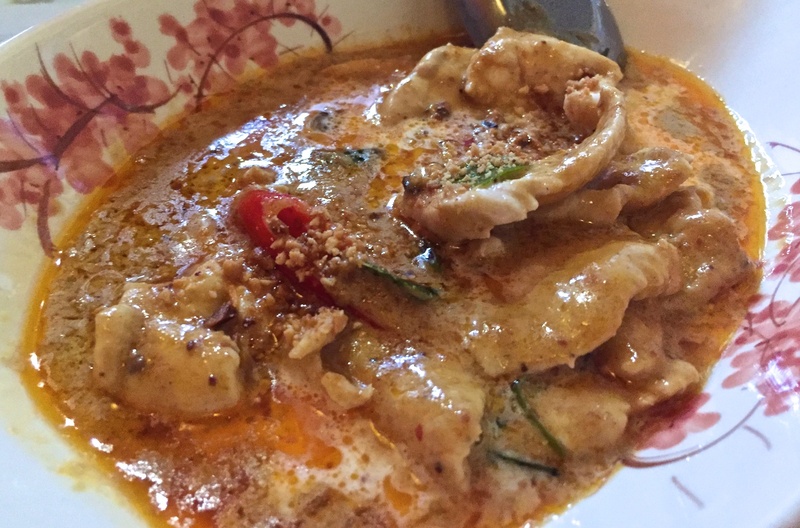 One of the best thai curries I’ve ever had in my life was in Braga, in northern Portugal. This is probabably the best, most comprehensive post, on Portuguese heritage, I’ve ever read! Thank you and well done! Interesting stuff, Aaron! Great read!